There is a growing incidence of toxic leadership in organizations across the world. This is clear from anecdotal evidence as well as research which suggests that one out of every five leaders is toxic. My own research shows that close to three out of every ten leaders are toxic. This cancer of toxicity threatens the well-being of both individuals and organizations. It also affects the performance of a society and country. That’s why there is a pressing need for leaders to understand the nature, dynamics, and evolution of toxic leadership and organizations. The word “toxic” comes from the Greek “toxikon” which means “arrow poison”. In a literal sense, the term in its original form thus means to kill (poison) in a targeted way (arrow). Toxic organizations and leaders, therefore, are those who deliberately destroy the fabric of the institution. What makes a Toxic Leader? Toxic leadership represents the “dark” side of leadership. It affects individuals as well as organizations. In the case of individuals, toxic leadership refers to ongoing, deliberate, intentional actions – the “arrow” – by a leader to undermine the sense of dignity, self-worth, and efficacy of an individual – the “poison”. This results in exploitative, destructive, devaluing and demeaning work experiences. These destructive actions may be physical, psychosocial or even spiritual when they diminish a person’s meaning and purpose. A toxic organization is one that erodes, disables and destroys the physiological, psychosocial, and spiritual well-being of the people who work on it in permanent and deliberate ways. In other words, an organization becomes metaphorically a “poison pill” for employees. Workplace bullying is similar to toxic leadership but is just one form of it. Bullying is more centered on the individual, one-on-one, physical or emotional abuse by any one individual, including a leader, on another person. In contrast to toxic leadership, healthy, authentic leadership nurtures and affirms the dignity, worth, and efficacy of an individual. It creates enabling, empowering and meaningful work experiences. And a healthy, authentic organization is one that nurtures and grows the physiological, psychosocial and spiritual well-being of its organizational members. Can Toxic Leaders be Competent? Leadership toxicity and incompetence are not directly related. Both competent – getting the desired results – and incompetent leadership can be toxic. If a narrower definition of competence is used – only focusing on technical and professional competencies – a toxic leader may still be seen as competent because they are “delivering the goods”. This is particularly true if a short term view is taken. But over the longer term, their short term success is unsustainable. This is because they are destroying their teams, departments or organizations in the process. If a comprehensive, long-term view is taken toxic leaders are incompetent because they are not competent across all domains of a well-rounded leader. Taking a comprehensive view, leadership qualities include personal attributes, technical and professional competencies, values and attitudes, and conduct. I believe that toxic leaders, regardless of their level of technical and professional competence, are incompetent. After all, competent leadership is all about getting things done with people. The Cold Fish: the ends justifies the means. So any decision and action is justifiable in terms of the results desired. The Snake: the world serves me in the endeavor to satisfy my personal needs like greed, status, and power. Glory Seeker: personal glory and public visibility at any cost, regardless of whether I have made any real and meaningful contribution. Puppet Master: absolute, centralized control over everything and anyone, under all circumstances. Monarch: ruling the organization as if it is my kingdom. All of its assets are available for my personal use. The more prolific these toxic leaders are in an organization, the more toxic the organization. 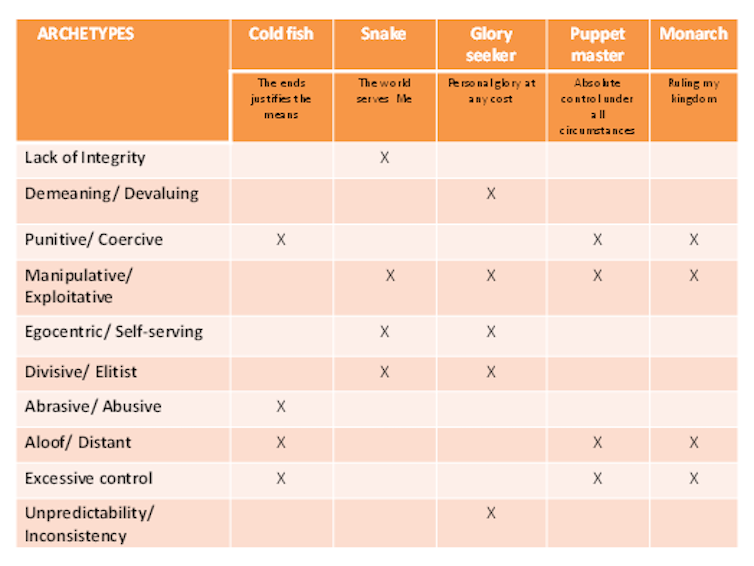 The table below profiles these toxic leaders. Negative emotional moods and mood swings: anger, despair, despondency, frustration, pessimism, and aggression. Employee physical and emotional disengagement and withdrawal such as absenteeism, lack of contribution, and turnover. Unethical, deviant conduct: theft, fraud, and sabotage. Low (team) morale and work satisfaction. Organizational dis-identification and low organizational commitment. But organizations can be toxic in their own right through the organizational culture they have. Organizational culture refers to shared ways of seeing, interpreting and acting upon the world that becomes ingrained in an organization’s DNA. It’s the glue holding it together and provides an organization with a way of looking at and relating to the world. Paranoid: the defensive, afraid, suspicious, trusting no-one or nobody organization. Compulsive: the over-planned and over-programmed organization. Hyperactive: the impulsive, unfocused organization, acting like an adolescent. Deflated: the energyless, depressed and impotent organization. Delusional: the reality estranged, make-believe organization, living in a world of its own. Conscienceless: the unethical, amoral organization. There appears to be a growing incidence of the cancer of toxic leadership and organizations. This is in no uncertain terms endangering the well-being of organizational members, compromising future sustainable organizational, community and societal performance and success, as well as the very continued existence of them. This article is based on a longer, more comprehensive academic paper.